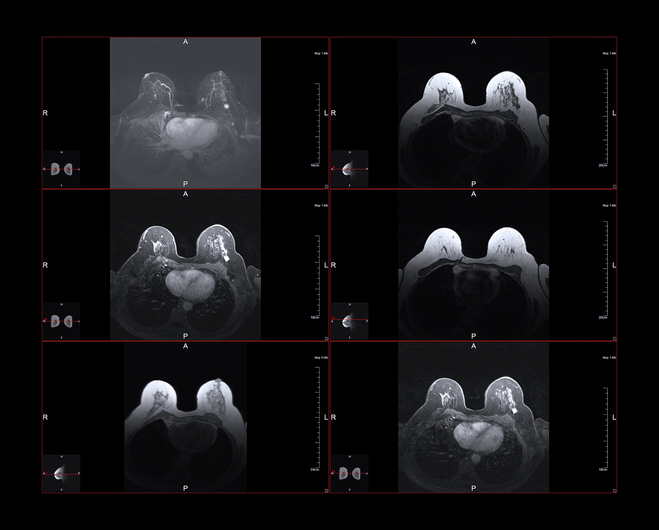 Two Views of breast MRI scans. A doctor or physician may order an MRI scan of the breast in addition to a mammography or ultrasound. An MRI is useful because it shows healthcare providers what tissue is normal, and what tissue is not. It provides clear pictures of the breast that may not be easily seen on a mammogram or ultrasound. An MRI of the breast can show blood flow through the breast area as well as blood vessels in the breast area. A breast MRI scan may be done to check for certain cancers or other illness. The MRI may show tissue that has cancer cells and tissue that does not have cancer cells. A breast MRI can be used to guide doctors or surgeons during a procedure, such as a biopsy. An MRI scan may be used if surgery is needed to remove a growth or lump. A MRI scan of the breast can show healthcare providers how well a treatment for a disease is working and the results of a quality MRI scan can help in the plan for the best treatment forward. A MRI of the breast can distinguish between scar tissue and tumors in the breast. Tumors, growths and lumps can be found and evaluated with an MRI of the breast. A MRI of the breast can guide a biopsy. A MRI of the breast can further evaluate difficult to determine abnormalities seen on mammograms or ultrasounds. A breast MRI can screen for cancer in women at high risk for breast cancer. A MRI of the breast can find cancer remaining after surgery or chemotherapy. 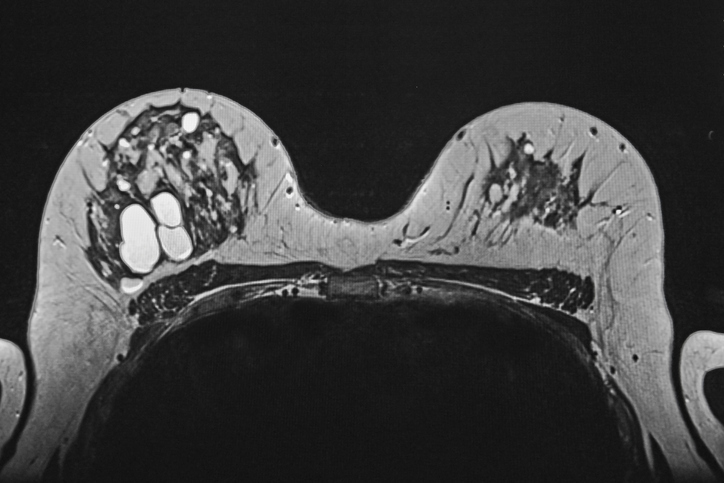 A breast MRI can also test for determining whether silicone implants have ruptured. 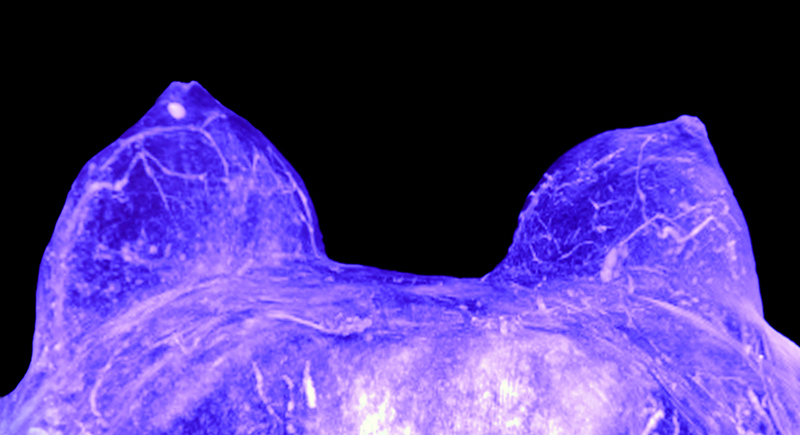 ABOVE: Often called an MR, this mammogram captured through a MRI has been tinted to highlight the image. 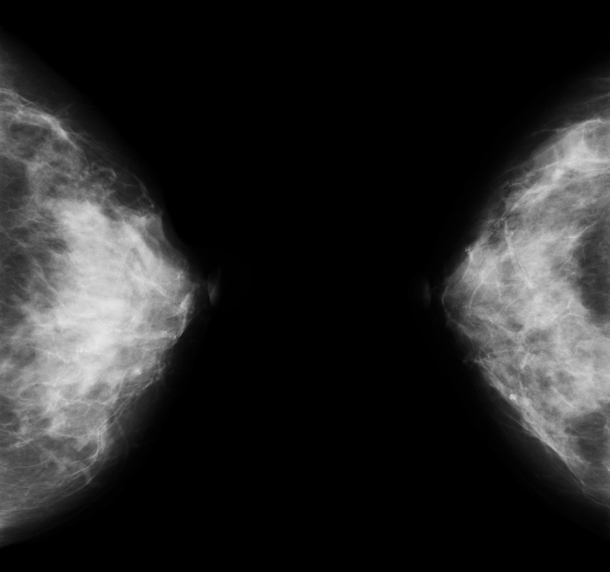 ABOVE: Individual MRI scans of the breast. ABOVE: Single MRI or MR image of breast. This is considered the MRI version of a mammogram. ABOVE: This is a mammogram. See how it differs in the visual information it provides.